I've decided Saturdays are now Giveaway Saturdays on Book Cracker Caroline. I will be posting a giveaway every Saturday. This week's giveaway is for a paperback copy of Keri Smith's The Pocket Scavenger. 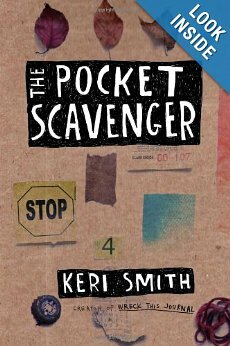 Within the pages of The Pocket Scavenger, you’ll be instructed to go on an unusual scavenger hunt, collecting a spectrum of random items: something that is miniature, a stain that is green, something from the year you were born, a used envelope, and more. Once your quarry is in hand, you’ll apply an alteration dictated solely by chance: create a funny character, make it into a building, conceal it, add polkadots, remove a section, add stripes, scribble on top, fold, turn into an article of clothing, make it “pretty,” and so on. The results: you’ll be forced out of habitual ways of thinking or acting, discover new connections, and try things you might not have done on your own, creating a version of The Pocket Scavenger that is unique, dependent on time, place, experience, and you. I've never been on one, but my teens have through school groups or my daughter through youth group and they sound really fun. Yes i have in a few and they are very fun.